Full-featured kit for standalone prototyping or as cellular plug-in for popular Maker platforms. 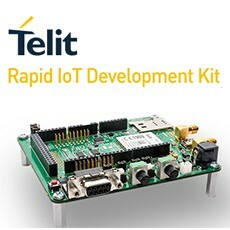 Telit, today announced a Rapid IoT Development Kit with built-in cellular connectivity and seamless integration with the Cloud-based Telit IoT Portal – reducing IoT solution prototyping from weeks or months to mere hours. The comprehensive kit can be used to develop standalone IoT prototypes or as a convenient cellular, Cloud-ready plug-in for popular open Maker platforms. The intuitive IoT Portal lets users connect and manage the kit, and makes it easy to securely extract and consume data by using built-in dashboards, designing web-based and mobile apps, and integrating with enterprise systems for big data analytics. “Telit and the Texas Instruments (TI) LaunchPad™ development kits are a powerful combination for any developer looking to prototype a robust and complete IoT solution,” said Adrian Fernandez, Microcontroller Development Experience Manager, TI. The Rapid IoT Development Kit operates in both standalone mode and interface mode. As a standalone device, it operates solely with the unique on-board processing power of the Telit xe910 module based upon the AppZone C development and runtime environment. There is a variety of sensors already on the board including accelerometer, temperature and LED indicators. In interface mode, the on-board headers enable quick plug and play stacked integration with the most popular open Maker platforms such as Raspberry Pi, TI LaunchPad, and Arduino – all free of connecting cables.